Would the rust belt benefit from a journal of its own—a medium chronicling its resurrection or continued decay? 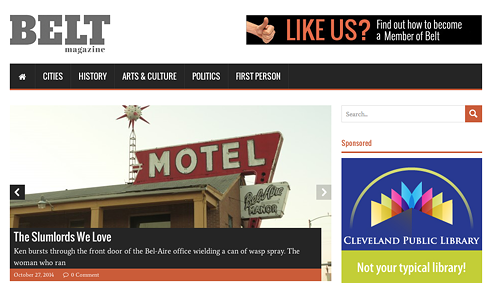 For the past year, it's had one in Belt, a website by Anne Trubek of Cleveland. Its focus, says the site, is "longform journalism, op-eds and first person essays of interest to the Rust Belt and beyond." Trubek says Belt serves "a massively underserved population of readers" and she's compared it to the New Yorker. At first Trubek couldn't look far beyond her corner of Ohio, but she's added staff, including senior editor Martha Bayne based in Chicago. Bayne used to occupy the office next to mine, and she tells me in an e-mail that Belt reminds her of the Reader she worked for in the 90s, the "fat old Reader of the 8,000 word feature on Chicago bricks, etc—meticulously worked feature writing that was published with little to no regard for a) word count and b) news hook." I think the Reader has done a pretty good job of linking Chicago's scattered pools of young urban professionals into a community; can Trubek do the same thing with a region she's defined as stretching from Buffalo to Milwaukee and south to Saint Louis? I'm from Saint Louis, and a lot of people there would deny they have anything to do with the rust belt; we're too southern and too western, they'd say. A lot of Chicagoans would protest too: we're a world-class financial center that just happens to share a cluster of lakes with Detroit. Belt makes its content available for free. Instead of a pay wall, Belt has a book publishing arm, which has published anthologies of writing about Cleveland, Detroit, and Cincinnati and just produced a collection of writing from Belt's first year, Dispatches From the Rust Belt.” What Trubek has discovered, Bayne remarks, is that "people are willing to pay $20 for a book but they won't pay $20 to read a website for a year." I emailed Trubek some questions. "I referred to Chicago, when we launched Belt, as being an 'asterisk city'—I did not see it as part of the demographic/geography we were aiming to write about—but also not entirely out of it, either. One shorthand I use to define the rust belt is 'the industrial midwest that used to do better than it is doing now.' Chicago is certainly part of the industrial midwest, but its economy was never as wholly dependent on steel and cars, and it is not suffering the loss of manufacturing as other places are. However, it was built around the same time as the other rust belt cities, has similar immigration history, and is wrestling with postindustrial issues as well being that global financial center." When the rust belt is examined as closely as you intend to examine it, is there such a thing as a "typical" Rust Belt city? "There are discernible regional connections between rust belt cities—or, more precisely, industrial midwestern cities . . . the role of industrialists and robber barons in establishing important institutions that continue to define the cities (and the active presence of old money in those cities today), immigration history, racial demographics, labor history. Many rust belt cities—let's put that asterisk back on Chicago—are facing similar difficulties—aging housing stock (if the cities were built up around the same time, those buildings are now aging together . . . ), the loss of manufacturing, depopulation, vacancy, the prospect of shrinking, etc. "At the same time, it is indeed the differences that define each place as well—and also what we do at Belt. What is unique and worth recording, remembering, and reflecting upon in each city? In each neighborhood? Here again Chicago may gain back its asterisk, because one purpose of Belt is to write about (surprisingly) under-written about places. but Chicago has a robust, healthy tradition of writing about itself." But that said, the city teems with untold stories. She named one told in Belt that I hadn’t seen anywhere else: a piece by Jake Austen on the old south-side amusement park, Fun Town. Trubek doesn't know whether the rust belt must rise and fall as one—Chicago and Detroit at this point in time certainly suggest that's not necessary—but she'd like to think Belt will inculcate a sense of we're all in this together. I inflicted on her a paean to my home town. Saint Louis "doesn't think of itself as a rust belt city, and not only for geographical reasons," I argued. "Its industry, it would say, is grounded in high-tech products—chemicals and fighter jets—that can't be shifted to Bangladesh, and there's a rich intellectual heritage (Tennessee Williams, T.S. Eliot, Marianne Moore, William Burroughs, others) that gives the place a gravity way beyond its size." I went on, "What I suspect—but please tell me if I'm right or wrong—is that every place in the rust belt entertains similar thoughts. Every place thinks of itself as different and special—and perhaps is therefore reluctant to act in concert with the region." "And then there's a third group who doesn't like to identify with the rust belt—those who despise the term itself. These are often people aged 50-65 and who felt the brunt of the negative use of the term. I understand and respect those who get upset when people use the term. But for me, the term is one that is descriptive, not evaluative—it just describes the industrial midwest that no longer has a thriving manufacturing economy. And the phrase brings with it history, culture, and resonance. I mean, who wants to talk about the industrial midwest all day? There's no poetry in that phrase. Nor is there in the other popular brand-for-the-region-to-be, the freshwater region. I mean, to me that's really a euphemism for saying: "given climate change and other cataclysmic events, the Great Lakes will be the safest, least scorching place in the country soon. So move your business and families here and be safe from the apocalypse!" And she added, gratuitously in my view, "Finally, I would lie to add that I love Saint Louis and do indeed think of it as part of the Belt family of cities—particularly because of its literary heritage. I mean—this is a city that sort of scorned Eliot b/c he got all too big for his britches and went off to Europe and didn't kowtow to the hometown, amirite? And Eliot was like—yeesh, you guys are a bunch of provincials, no? That's a very Belty kinda story right there." I have family in Cincinnati. The hills are pretty.